Yammer is a private social network for staff within a business or organisation. Just like Facebook you create a profile, and can follow people, join groups, post status updates, share files, and more. You also have a timeline where you can see updates from the groups and people you follow. Our Yammer network was set up nearly a year ago for us all to explore and learn to make use of, without much restriction. The number of colleagues signing up to our Yammer network has increased sharply over the last few months. The latest figure shows that 75% of staff have signed up, but how many of these people are actively using Yammer? How many are simply “lurking” – reading other people’s posts, but not posting or more actively engaging themselves? As an individual, you can certainly get some benefit from simply being a passive Yammer user – it’s an excellent source of information. You can find out what colleagues across the organisation are working on, and get the latest updates from projects and policy areas you’re interested in. However, the real benefits for staff and the organisation as a whole come when a critical mass of employees are more actively using the site to read, engage and share content. Like all “crowd-maintained” social facilities, there’s a direct link between how useful Yammer is and the number of active users. To fully realise the benefit of Yammer within the SFA, we need to invest in our culture and also encourage and enable staff to become active users. Making use of Yammer to openly share information, updates and knowledge contributes to the organisation culture. To help staff become more active users, my colleague and I have been running short introductory sessions on Yammer. We cover some basic “how tos”, provide hints and tips on getting the most from Yammer, and discuss how Yammer could support their work and projects. We’ve found one of the key challenges is helping people to overcome their fear of sharing, and encouraging them to “work out loud” – to use Yammer to share what they're doing and to make their work more visible. The SFA's most significant assets are its people and their knowledge. Our culture and values are about developing people and making the SFA a great place to work. Yammer complements other internal communication channels and can help us all to work together, communicate efficiently, improve productivity, and keep up to date. As a Business Change Manager, I’m particularly interested in how Yammer can nurture the culture in an organisation and make continuous improvements to the way we work. Staff from across the SFA have joined a Continuous Improvement Yammer group. Members work in different teams, in different cities, and at different levels of the organisation. People who had not previously worked together, or even spoken to each other, have come together on the group to share their experiences and build on each other's ideas. When someone has a question, but they're not sure who to go to for the answer, posting it on Yammer often results in a quick answer. Performance and usage statistics on our Apprenticeships digital service are regularly shared on Yammer. Previously these stats were emailed to a set group of people who were directly involved with the service. Now any member of staff can read and discuss the data, and use it to inform their work. Teams have created open Yammer groups to discuss their work. For the team members, this has reduced the volume of emails they receive, as discussions take place on the group rather than in long email chains. The teams are also “working out loud” - making their work more transparent. Anyone interested in a team's work, can join the group to stay up to date, participate in discussions, and share ideas. Staff use hashtags to categorise their Yammer posts and link them to similar conversations that are happening across the site. There have been many occasions when, through Yammer, someone has discovered that a colleague was working on a similar piece of work. They've then been able to share ideas, work together, and avoid duplication of effort. 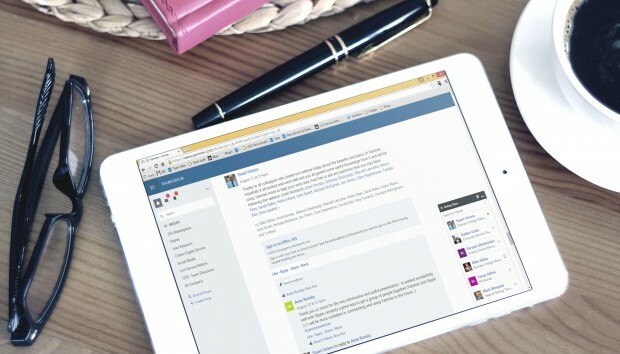 Do you use Yammer in your organisation? Let us know your thoughts in the comments below. If you work for the SFA, you can follow me on Yammer and sign up for one of our Introduction to Yammer sessions. We use a tool similar to Yammer in my company. It's been really influential in allowing a very geographically dispersed business to have a common identity. People can ask for support when they need it - rather than when back office functions have arranged a site visit or training session. Our CEO uses it to have public conversations - both posting photos & comments on his visits and activities and also commenting on posts of colleagues' successes and challenges, providing visible support. Team leaders are supplementing "upwards" reports of progress with posts allowing visibility from every-place and every-one who chooses. The success of this tool has been aided by a enthusiastic championing, nudging and "gardening" of the community over a period of around 18 months. It's taken time and investment by people willing to take the risk and have a go, but it's proving its value as more and more people are engaging, lurking and posting.